**Update: Though the deadline has come and gone, two spaces remain in this commission drive. As I have extended the timeline for premiere performances to occur any point in 2019, these spaces will remain open until filled. Please contact me at thomasrosinlavoy@gmail.com for more information. - Commission a work for your choir at a substantially discounted price. - Four commissions will be offered for the theme of "fire" and four will be offered for the theme of "water." - Works will be for SATB chorus with no divisi, with or without piano accompaniment. - Intended for premiere performances in 2019. - Resulting scores will be collected into an anthology, published by Hewitt Hill Music. - Deadline to sign up: October 31st, 2018. After completing my PhD in 2017, I decided to celebrate by offering a deep discount on commissions for a limited period of time. The overwhelming response to this idea was truly incredible. The result of this first commission drive was a collection of eight accessible works for SATB chorus, commissioned by choirs from Scotland, New Zealand and five U.S. States and all premiered earlier this year. Miraculously, all of the texts agreed upon by myself and the individual organizations were themed around the night sky - hence the title for this initial collection: Starlight: An Anthology of Works for Mixed Chorus. Having had such a fruitful experience composing these pieces and working with such wonderful choirs, I have decided to once again offer a steep discount on commissions for the first eight choirs to sign up by October 31st, 2018. This year, however, I have chosen the theme ahead of time: Fire and Water. These elemental subjects will offer a number of diverse and visceral options from which commissioning ensembles can choose, while maintaining the focus and theme of the project as a whole. 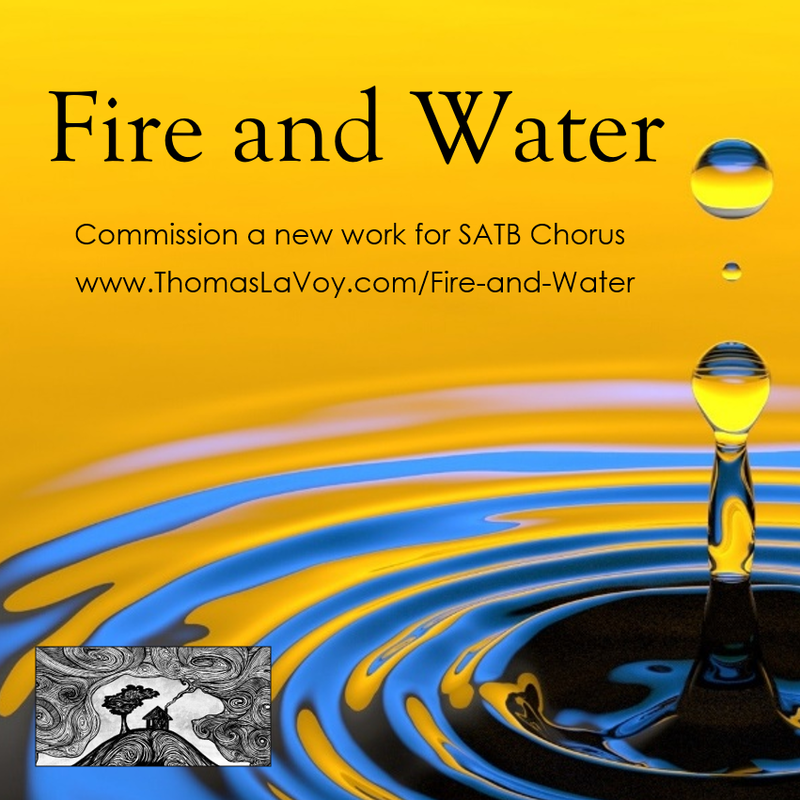 The text of each work will be decided upon by the composer and the ensemble, but four commissions must be themed on "fire" and four must be themed on "water." First come, first serve! If you are interested in taking part in this exciting opportunity, please email me at thomasrosinlavoy@gmail.com. I would love to hear from you! "Neither the Moon by Night," a new setting of Psalm 121, was commissioned by the choirs of St. Kentigern College in Auckland New Zealand (Lachlan Craig, conductor). The work is specifically constructed to be sung with either a full SATB choir with piano OR the treble line alone with piano. Performed by Austin Cantorum (Cristian Cantu, conductor), who commissioned this work for premiere performance in Spring 2018. "In the Dark of the End" was jointly commissioned by the choirs of Cambridge High School (Milton, GA) and Nathan Hale High School (West Allis, WI); Matthew Van Dyke and Zachary Beeksma, conductors.